UMSL alumna Mia Michael, BA history 2013, recently visited Ireland through a study abroad program while a student at UMSL. 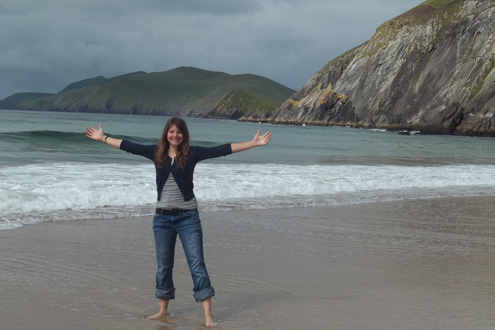 She is seen here visiting a beach on the Emerald Isle. Opportunity.This one word has transformed my life and can transform yours. Study abroad can prove to be one of the most gratifying, adventurous, challenging and extraordinary opportunities that you undertake in life. It certainly has been for me. I sought opportunity this past summer for six weeks studying and traveling across Ireland as a participant in the Irish Summer School at the National University of Ireland, Galway. During my six-week stay on the Emerald Isle I was able to earn six credits transferred back to UMSL, fall head over heels into Irish culture, and best of all, embrace the challenges and rewards of leaving familiarity behind. For the Irish Studies program at NUIG, each student was given the choice of enrolling in two courses concerning Irish subject matter, including literature, film, dance, music, archaeology, history and society. Our classes were taught by Irish professors renowned for their expertise in their separate academic fields. Each class met two to three times a week for one to two hours. 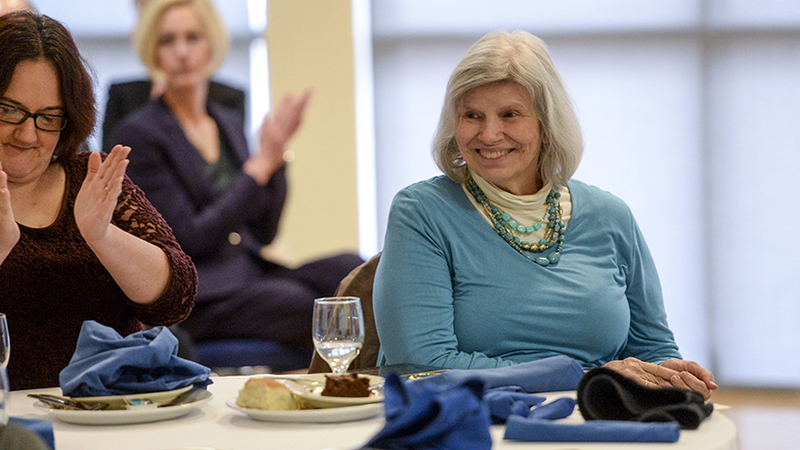 Professors and the school’s staff readily answered questions from fellow students and myself and sought to provide a helpful environment conducive to learning. Additionally, the summer school organized interdisciplinary seminars led by faculty on such topics as Irish emigration, nationalism and sport. It allowed us to dive deeper into an understanding of Ireland from an Irish perspective. My experience in Ireland was educationally enhanced even further through weekend field trips arranged by NUIG to the Aran Islands and to the Dingle Peninsula. Rather than simply talk about these historically fascinating locations, the school provided for us to travel to and explore them, significantly increasing our cultural immersion. I savored standing on Ireland’s southwest shore looking westward while waves from the Atlantic Ocean rolled in over my bare feet. Likewise, towering over the Atlantic on a 300-foot cliff situated at the pre-historic Fort Dún Aonghasa was breathtaking and historically magnificent. After the four-week program ended, I decided to take off on my own one-and-a-half week exploration of Ireland. Traveling alone, I ventured again to the southwest coast of the island staying another night in Dingle and two nights in Killarney. After renting a bike, I rode the Slea Head Drive through a couple of rain showers and past a few sheep. 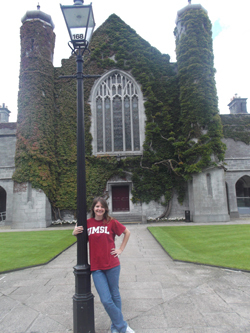 Alumna Mia Michael, BA history 2013, poses in the Quadrangle at the National University or Ireland, Galway, which she visited through a study abroad program while a student at UMSL. Famine huts littered the countryside and a gentleman overseeing their upkeep chatted with me for a bit after I had the chance to walk in them and picture what life may have been like during the Great Famine. After leaving the southwest, I travelled to Dublin where I spent three days soaking up Irish nationalism, meeting scores of people from all over the world, and enjoying the simplicity of traditional Irish music, friends and laughter. Continuing northward, I stayed next in Belfast, a city of turbulence and division, but also a city progressing steadily toward unity. During my visit, a bus tour took me along the north coastline to the famous Giant’s Causeway (a geologic masterpiece), to the centuries-old ruins of Dunluce Castle, and on to the historic walled city of Derry. In Belfast, I participated in several walking/driving tours of nationalist and loyalist neighborhoods gaining a perspective of history not possible in a classroom. Before returning to the States, I stayed one last weekend in Galway and celebrated the unforgettable memories made over the summer. Study abroad in Ireland has been one of the most outstanding experiences in my life. Not only was I given the opportunity to dive right into centuries of Irish history, explore castles and enjoy engaging conversation in many a pub, but I discovered what living is truly about. Stripping away familiarity and living in a different culture forced me to appreciate the beauty of living one day at a time rather than taking life for granted. Sometimes the best way to learn is to dare to step away from what we know, what we are certain of and instead trust in the possibilities that await us. You cannot put a price on memories made in a distant culture nor on education and experience gained from a different perspective. So stumble into adventure; wait … just run right into it! 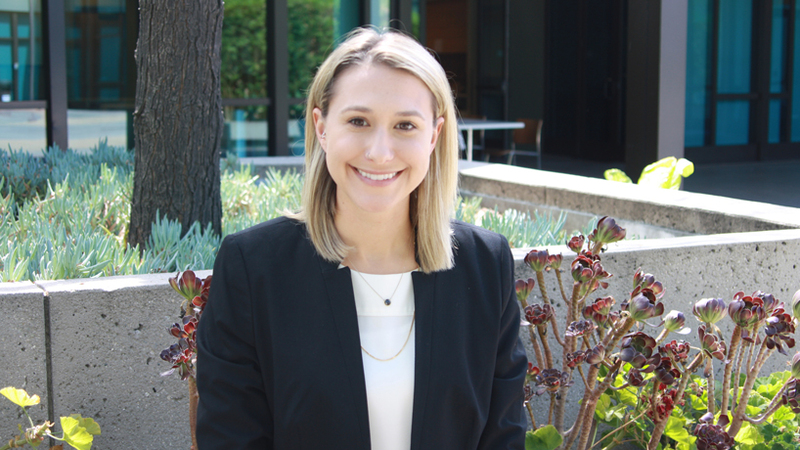 I urge you: explore, engage, be excited, be nervous and completely embrace the opportunity that awaits you through the UMSL Study Abroad Office. 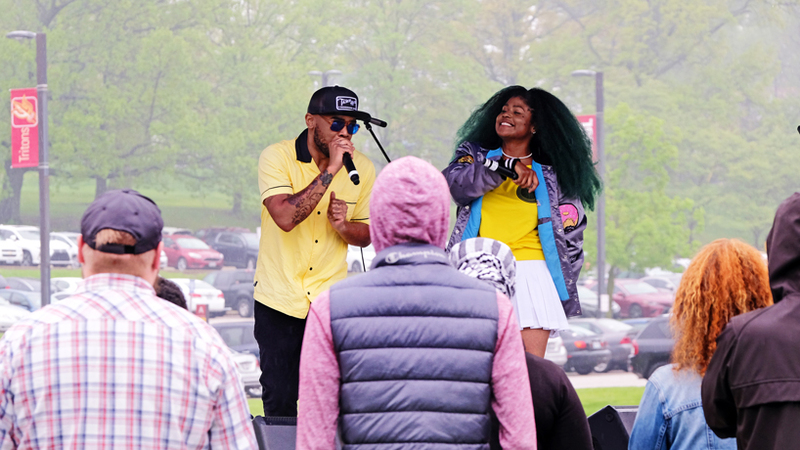 Mia Michael earned a bachelor’s degree in history from UMSL in May. She was also a student in the Pierre Laclede Honors College.